Using their so-called hunger algorithm, the ‘Hungerithm’ tool detects the hanger (hunger + anger = hanger) level of the internet until Dec. 31. When consumers drop hints of hunger online, the coupon discount of SNICKERS® increases at participating U.S. 7-Eleven® stores in real time. . 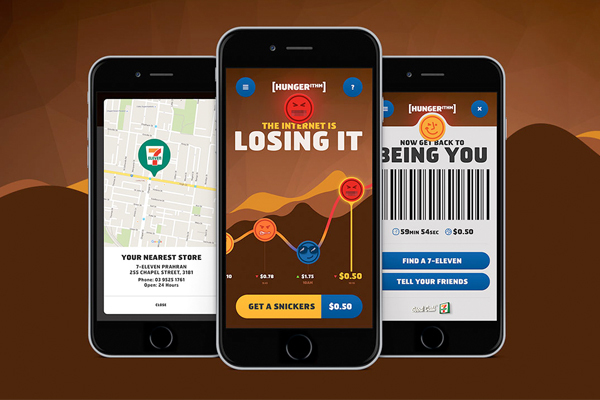 Originally piloted in Australia 7-Eleven, “Hungerithm” was developed by Clemenger BBDO Melbourne under the “You’re Not You When You’re Hungry” campaign. The algorithm checks social media posts in real time against a list of 3,000-plus commonly used words and phrases to determine sentiment and capture a snapshot of how people are feeling, as well as slang and sarcasm. As ‘hanger’ goes up, the coupon value goes up, too, according to the companies.